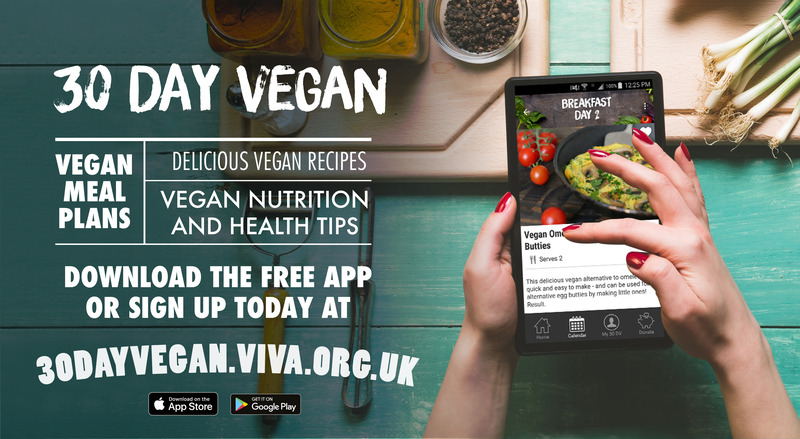 Vegan Charity Launches App to Help People Try Vegan Throughout 2019 | Viva! Vegan campaigning charity Viva! has launched its new 30 Day Vegan app to encourage people to try veganism, providing everything you need to take those first crucial steps on your vegan journey. The launch of the app comes as thousands of people across the UK finish their pledge to ditch animal products for Veganuary. The 30 Day Vegan app will help people continue their challenge, providing an additional 30 Days’ worth of delicious vegan recipes. The app features mouth-watering recipes, fit to appear on any plant-based foodie's Instagram feed. It provides comprehensive information about the health benefits associated with veganism and answers the most common questions that new vegans and veg-curious have. Individuals downloading the app are presented with two meal plan options: the regular 30 Day Vegan challenge and the Can’t Cook Won’t Cook meal plan which is based around “convenience style” recipes; for those considering veganism but struggling with time and cooking constraints. Once the meal plan has been selected, a daily notification reminder helps keep your meal plan on track and – if the animal welfare, health and environmental benefits aren’t motivation enough – the app offers rewards to give extra incentive to finish each week of the challenge. The recipes which feature on the 30 Day Vegan app are supported by Vegan Recipe Club, the charity’s online resource and app which aims to make going and staying vegan even easier – ensuring that your vegan challenge can continue beyond 30 days. "The interest in veganism is soaring! The demand for plant-based alternatives is increasing and this is reflected in the availability of vegan products. Supermarkets and restaurants are falling over themselves to provide delicious and accessible products for vegan consumers. Our new 30 Day Vegan app is here to make the transition to veganism even easier. The purpose of the 30 Day vegan challenge is to make it as simple as possible to transition away from animal products, all year round. Our original 30 Day Vegan website received such a positive response and so we believe an app is the next step in encouraging the public to give veganism a go. This January, take the challenge and begin your journey on the road to compassion!" Visit 30dayvegan.org.uk to learn more. For more information about this media release, contact Roisin McAuley, Viva! PR & Marketing Coordinator on roisin@viva.org.uk or 0117 944 1000, or email the press office press@viva.org.uk.